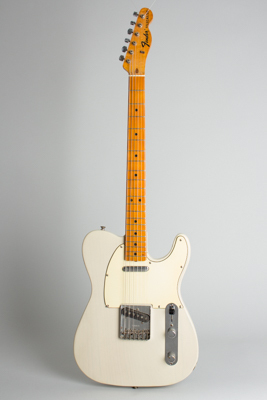 Fender Telecaster Model Solid Body Electric Guitar (1969), made in Fullerton, California, serial # 274530, Blonde lacquer re- finish, ash body, maple neck, original black tolex hard shell case. This 1969 Telecaster has had a somewhat eventful life (at least in terms of the finish), but remains a good-looking, fine-playing, and GREAT-sounding guitar. It's kind of a guitar version of "the abused kid comes through a hero" -- well, sort of. Anyway, most of the time when one finds a heavily altered vintage instrument the details are lost to history, but in this case the culprits signed their work -- or at least provided a paper trail that documents the steps along the way! The last owner of this guitar purchased it on Ebay in 2005, and at that time the seller provided a detailed history of the instrument since it was purchased in 1972. Over the years from 1972 to 2005 this individual sanded the body down and refinished it in Polyurethane THREE TIMES, which explains why the body edges have lost much of their sharpness. It was refinished AGAIN in 2005, this time in a sort of white/blonde late '50s-style lacquer, and to a more professional standard. The neck has its own stories; it was refretted nicely with Fender-correct wire and the fingerboard relacquered also in 2005. There is an older partial refinish/clear overspray over the back and headstock; it looks like other tuners were mounted at some point, but the original "F" logo Fender units are in place now. The most oddball repair is that at one time (probably during one of the multiple Poly episodes) someone misjudged re-drilling the neck/body mounting screws and managed to drill right up through the fingerboard, on the treble end just by the last fret. This has been neatly patched in but remains visible as a cautionary tale to folks working on their own guitars. Most of the hardware remains original, or at least period. The bridge is the 6-saddle unit Fender offered as a factory replacement for the traditional 3-saddle bridge in the 1970s, stamped Fender in front of the saddles. The pickups are period correct, although not original to the guitar. They were provided and installed in 2005 when the guitar was restored to its current state. The pickguard is original (with the pearloid reverse side) with one top corner chipped off at the screw. The serial number plate is original with the second owner's name and driver's license number lightly etched into it. The control plate and knobs are original, as is most of the wiring inside, although obviously the solder joints have been re-done multiple times. The original pots are date coded to 1966, which is typical for 1969-70 guitars. The original green-code stamp on the neck heel is visible, and although these are inconsistent in terms of how they are interpreted appears to indicate a 1969 origin. There is some original finish is still visible in the neck cavity and the original inspection mark can just be discerned. Although obviously far from a collector's piece, this is a great-sounding and playing telecaster, lighter than most at just under 7 lbs. and with a real ring to the tone. This one remains a winner despite decades of well-intentioned but now ill-advised seeming "care" and a superb gigging Telecaster. Overall length is 38 3/4 in. (98.4 cm. ), 12 5/8 in. (32.1 cm.) wide at lower bout, and 1 3/4 in. (4.4 cm.) in depth, measured at side of rim. Scale length is 25 1/2 in. (648 mm.). Width of nut is 1 5/8 in. (41 mm.). In its current state this guitar shows very little wear to the newer finish(es) and plays great. The chrome shows some wear and the foregoing catalog of modifications notwithstanding the guitar presents as quite clean now. Includes a worn but functional original HSC with one latch missing the outer parts and some water damage to the bottom end. Restored to Excellent Condition.